The APEX Youth Track Club is a national-caliber running program that is Competitive at the local, regional and national levels in all track & field disciplines by implementing USATF doctrinally sound methodologies and effective, professional coaching. One (1) post-season series of meets (USATF OR AAU). **In the event withdrawal from the team, or the season, is necessary, a partial refund will be considered. Dismissal from the team, based on misconduct, will constitute forfeiture of the registration fee. Final decision regarding the event(s) in which an athlete should compete rests with the athlete; however, APEX will recommend, based on its knowledge and experience in the sport of track & field, the event(s) in which it believes the athlete is most competitive, and highly encourage competition in only those events that match the athlete's skill set and physical capabilities. For the 2016 season, APEX Track Club will participate, as a team, in the USATF National Junior Olympic Track & Field Championships series of meets. Anyone interested in pursuing the AAU Junior Olympic Games must coordinate their athlete's participation in that series on their own. More specific information coming soon. APEX pursues a highly-competitive indoor track & field season. The meets are held, almost exclusively, at the Prince George’s Sports & Learning Complex (next to FedEx Field)—8001 Sheriff Rd., Landover, MD 20785 (be prepared to park at FedEx Field and walk a short distance to the complex). The season's practices start in early December and run through mid-March. The meets typically start in late-December and run through mid-March, culminating in the USATF Youth Indoor National Championship. Practices have traditionally been at Episcopal High School, Alexandria, VA, Monday & Friday, 7-8 pm. There are typically 15 training slots available on the indoor team. Simply put, for the youth (8-18 y.o.) aspect of APEX, parent involvement is MANDATORY. If your youth athlete is showing interest and ability in track & field at the level required by APEX Track Club, then you, as a parent, should want to give your full support to what your child is doing. Everything about APEX, a training- and competition-focused club, is high-speed, full-speed, and committed. That being said, roles on the team can vary from small to large, each one of which is very important in its own way. From being a parent race timer to being THE team Mom, the more involved the parents, the more involved the athletes, the more successful the endeavor. From time to time, we will ask specific parents to help out, but don't be shy about asking us if there is anything you can do, should you find a gap that needs to be filled. Finally, APEX loves subject matter experts. If you competed in track & field, help us coach. If you are a caterer, let's have a picnic. If you are great with databases, keeping track of athlete personal bests and team records is perfect for you. APEX watches the weather reports closely on practice and meet days. We cancel practices and meet participation only in cases of "severe" weather. Showers and light rain are frequent during Spring and Summer months; therefore, APEX will practice in rain, and on damp (but not soaked) surfaces. We WILL cancel when there is a high probability of thunder and/or electrical activity. Untimely downpours will also prevent or end practices. APEX DOES NOT CONFIRM a scheduled practice or meet; it only notifies of cancellations. APEX will notify of cancellations as early as is practicable, given the conditions. If an athlete does not enjoy training under less than optimal conditions, or runs the risk of illness in those situations, please err on the side of caution. Skills—Athletes in Apex Track Club will be taught the skills of track & field (running, jumping & throwing), and will be progressed through skill levels, learning and experiencing the skills in a fun and inviting atmosphere, while at the same time learning the value of friendly, exciting competition. 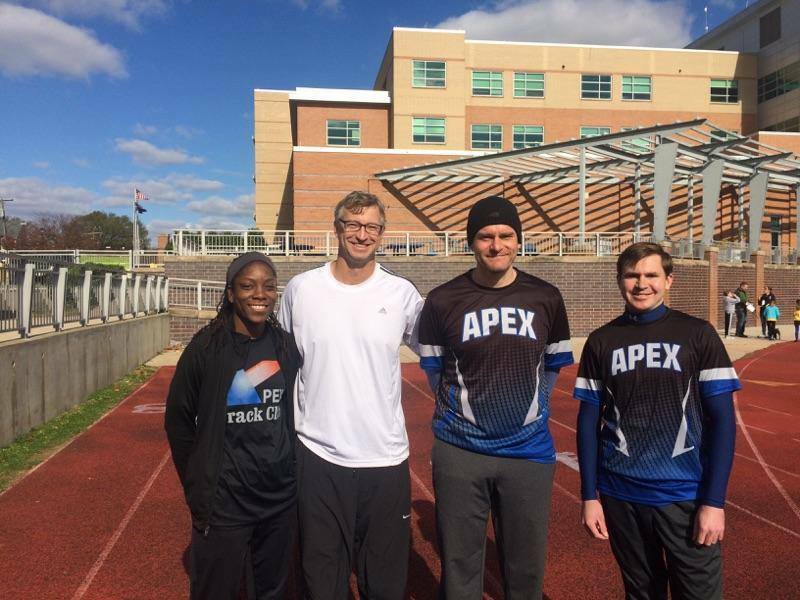 Experience — Athletes in Apex Track Club will learn the importance of team work and accountability through relay skills, as well as develop camaraderie among themselves in an individual team sport. Strength & Conditioning —Athletes in Apex Track Club will learn the basic progression of athletic practices, including dynamic warm-ups, performance skills sessions, aerobic and anaerobic conditioning, and stretching/cool down.